BeansLive - BeansLive.com gives you more than just a website. We're with you every step of the way. website. We're with you every step of the way. » Consulting - Speak with a web consultant for a one-on-one interview about your business and review site design options to determine a look and feel that best suites your business needs. During the interview, you will discuss with your consultant what makes your business unique to ensure the designed site is an accurate reflection of your business. » Design - Our expert web designers receive the information you provided during your interview and build an initial draft of your website for your review. Modifications to your site design based on your intial feedback will be completed quickly and a revised site will be submitted for your final review. » Web Design Approval - Upon approval of your web site design, the finished site will be published to our secure hosting servers and site will be available on the web. » Promotion - During the first 30 days of your service, our team will be submitting your website to Internet Directory Pages and search engines to inlude Google™, Yahoo!®, AOL® ,BING®, ASK®. Our experts take care of everything for you! » Support - We pride ourselves on the level of professional support we provide from free ongoing website changes to answering important Internet marketing questions. Our team is eager to speak with all of our customers. 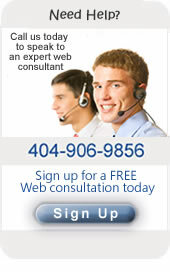 Call 404-906-9856 to speak to one of our experts. » Modify - Once your website has been built, you can contact our Support Team to make any changes you’d like. 30 minutes of design and web consultation every month are included in your package. For your convenience, most modification requests can be handled via an email to our support team at [email protected].